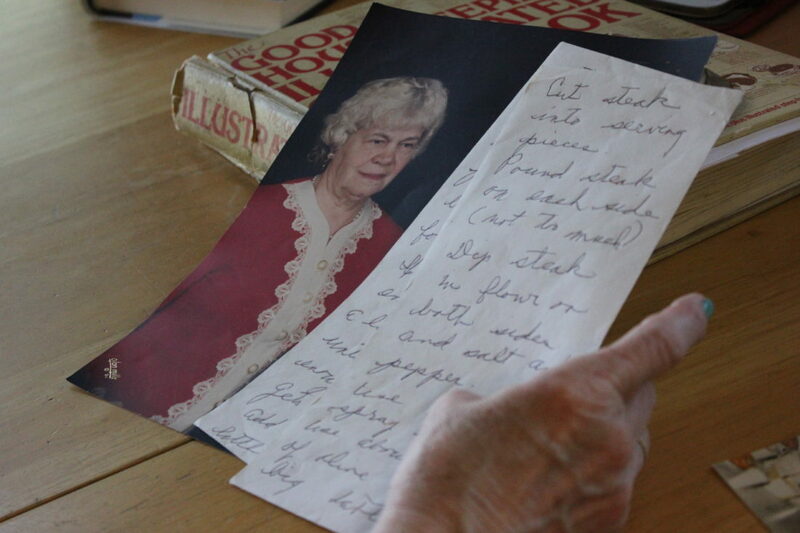 JANELLE PATTERSON The Marietta Times The handwritten recipe of baked steak is still kept on its original envelope written by Irene Weddle, left, in the treasured family cookbook of Vicki Ayers years later. Memories of mom often revolve around the food, family and laughter in the kitchen. For Vicki Ayers, 64, of Oak Grove, baked steak is more than just a meal that was the key to her late husband’s heart. It’s a memory, enveloped with the love of her mother, Irene Weddle, who despite a challenging start at the Washington County Children’s Home, became a beloved foundation in the lives of her siblings, children and many grandchildren. “She was always a caretaker, she always loved to cook,” said Ayers. But Grandma Weddle wasn’t one to write down recipes. She just knew how to make bread, pies and steak by heart. That’s why the handwritten recipe for her baked steak, scrawled in cursive on the faces of two envelopes, is even more special to Ayers. Those envelopes still exist today, more than 30 years later, though both Weddle and Doug have passed on. Ayer’s nephew, Brent Long, 39, also has fond memories of Grandma Weddle’s cooking. In fact, Ayers gave the baked steak recipe as a bridal shower gift to Brent’s wife, Nadia, years ago. Bill McFarland, of Marietta, said he can’t pinpoint a specific meal or recipe that has shown the love and commitment his wife Mariann has given to their family. Similar love was spoken of Betty Warman, the late mother of Susie Warman, 56, of Marietta. They’re the kind of brownies that melt in your mouth, moist fudge that has no business not being messy, Warman said. The second recipe Warman has held onto is that of brownie pudding. And though the recipes for pot roast, creamed potatoes and chicken noodles have not lived on, Warman says that makes the recipes for brownies and brownie pudding all the more special. “I still live in my mom’s home and there’s a tile my sister made here that says ‘Betty’s Kitchen,'” she added. – Cut steak into serving pieces. – Pound steak on each side, not too much. – Dip steak in flour on both sides. – Use vegetable spray in a skillet. – Use about a quarter cup of olive oil. – A big table (silverware) spoon of margarine and melt in skillet on medium heat with the olive oil. – Add steak and brown along both sides. – When brown, put in a baking dish or pan. – Add flour to skillet and brown a little before adding water to make gravy. – Stir and wait until the gravy thickens. * If gravy gets too thick, add just a little more water. – Serve with mashed potatoes and green beans. – Melt ¢ cup of butter with 6 tbsp. of cocoa. – In a bowl, beat 2 eggs slightly, add 1 cup of sugar and ¢ tsp. of vanilla – stir. – Add melted butter and cocoa mixture – stir. – Stir in § cup of flour and ¢ tsp. of salt. – Pour into a buttered pan and bake in 325 degree oven for about 20 minutes. – Top with fudge icing. – 1 stick of butter. – 1/4 cup each cocoa and milk. – Combine, bring to a boil, boil one minute. – Once the icing hardens, they are ready to enjoy. – 2 teaspoons of baking powder. – 1 1/2 tablespoon of cocoa. – Mix well, pour into baking dish. – Combine § cup brown sugar and ™ cup cocoa; sprinkle on cake. – Pour 1 ¢ cups hot water over all. – Bake 45 minutes in a 350 degree oven.